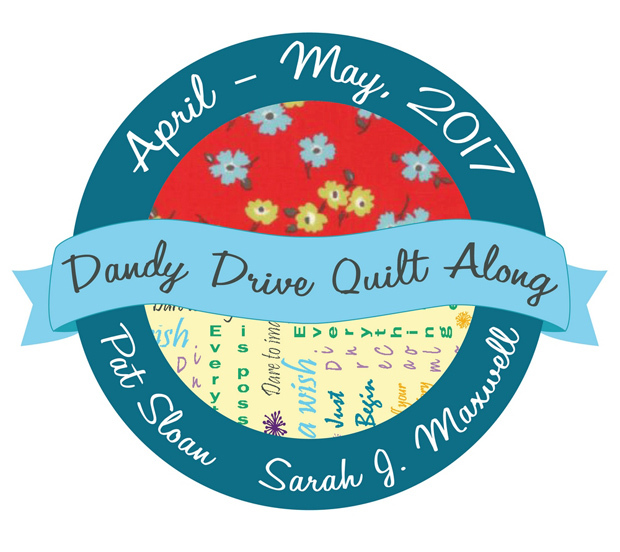 Hey everyone - it's week 4 of Quilter Pat Sloan and Sarah J Maxwell's Dandy Drive. This week is all about the butterflies. Week 1 was the 9 patch blocks, week 2 was putting together the outer flower pieces (as shown below) and last week the stem blocks. These buttterflies (above) don't have their outer background pieces on them but will eventually when. I have more white fabric. Who knew I would go through a bolt of white so quickly. I had some for these two below and love how they are starting to look with all the flowers and my one stem block (again waiting for more white). 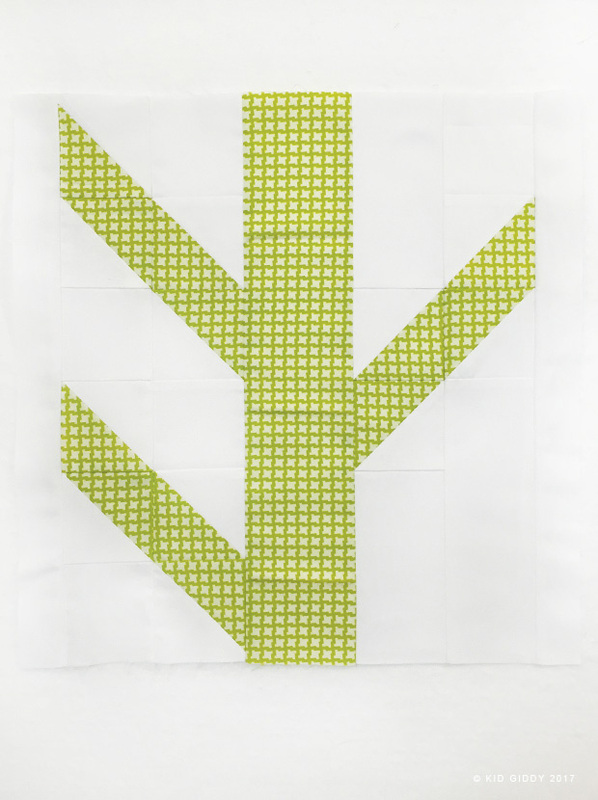 If you are new to this quilt along - Pat and Sarah have some fun things planned with prizes each week and the pattern is...FREE! 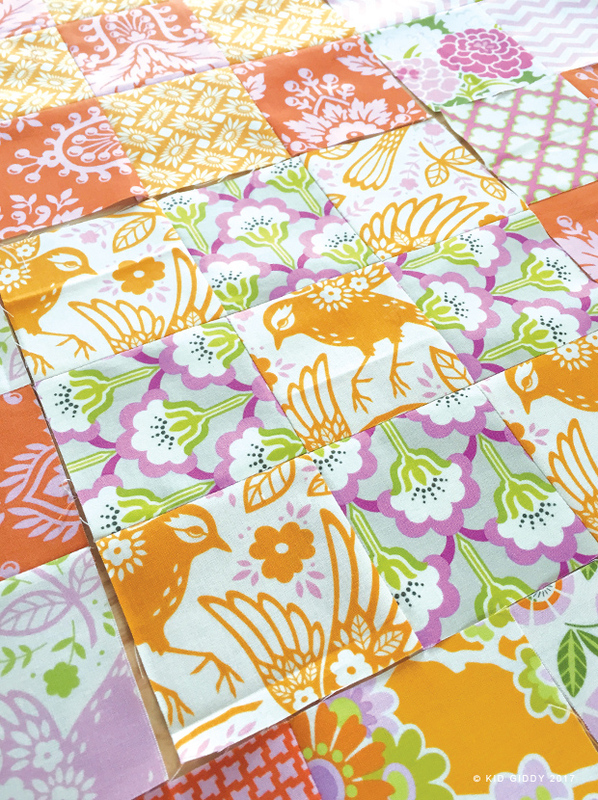 You can download the PDF files each week over on Sarah's website Designs By Sarah J. I'm making my quilt with some of my hoarded Heather Bailey's Up Parasol fabric collection as well as some prints from her True Colors and Lottie Da collections. To get started you can check out the yardage info here (Sarah's Dandy Drive Yardage Requirements). Pat and Sarah put together a really fun group of friends for this sew along too. Need some inspiration? 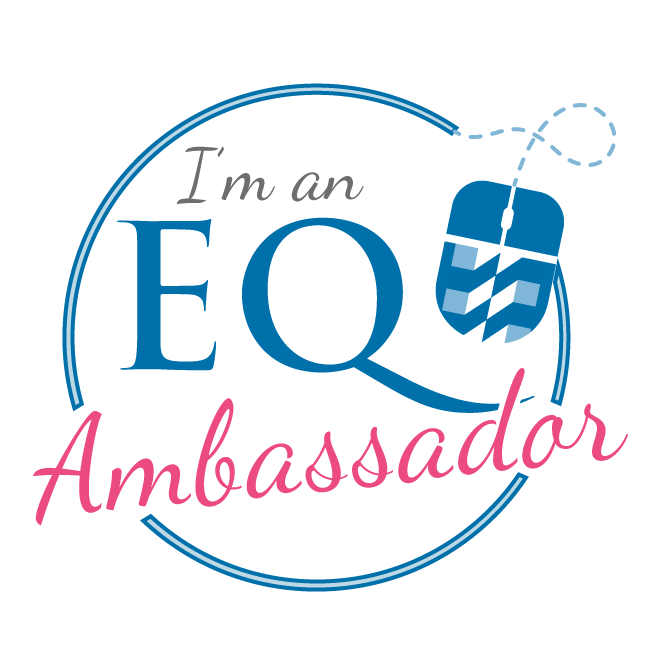 Check out everyone else's blocks by clicking the links below to see all the possibilities. 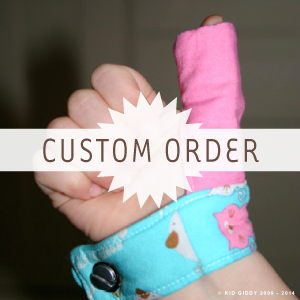 I'll be sharing more of my blocks on my Kid Giddy IG and Facebook too throughout the week. So the prize this week. 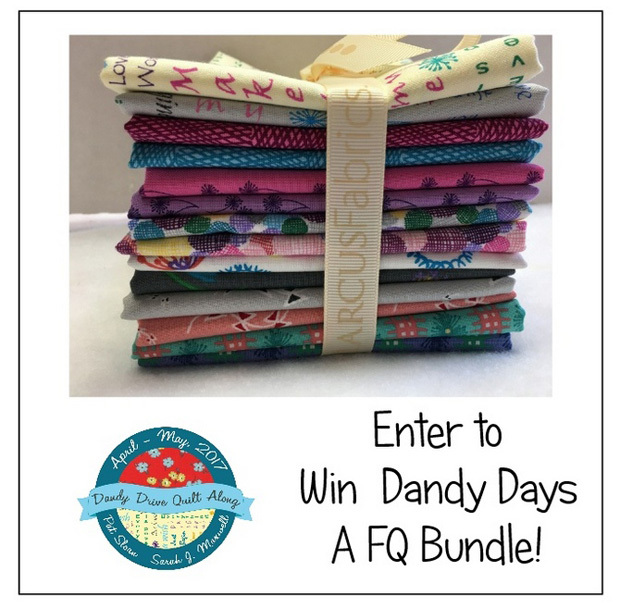 . . they want to give one lucky participant a Dandy Days FQ bundle. Head over to Pat's website (click the image above) and simply enter a pic of your block via the blue button link on her post. Thanks so much for stopping by. I'm looking forward to seeing all of your butterfly blocks. 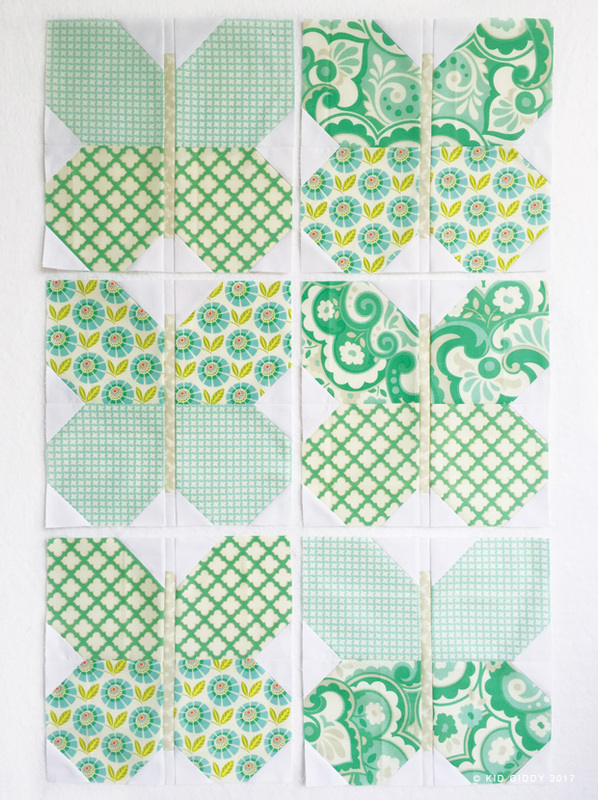 I missed posting last week here on my blog - but if you are following my on IG - you might have seen one of my flower blocks and the new (portable) design wall I made with some of my blocks on it. 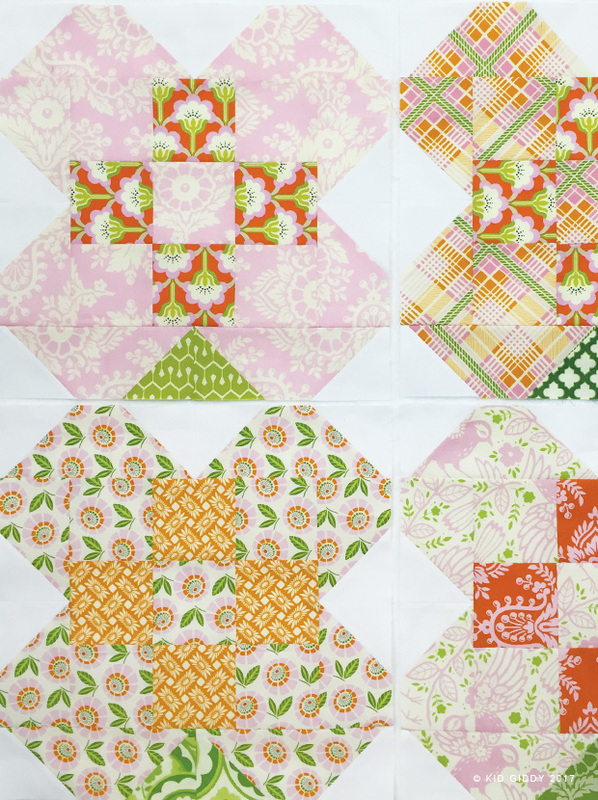 As you know - Quilter Pat Sloan kindly invited me to be a part of Sarah J Maxwell's Dandy Drive quiltalong and it started 2 weeks ago...plenty of time to catch up if you are just getting started. Week 1 was the 9 patch blocks, week 2 was putting together the outer flower pieces (as shown below) and this week...the stem blocks. As I made my stem blocks - I want to put out this PSA - read Sarah's instructions first. I knew something was wrong when my HST's were still 3 3/8" instead of 3". I luckily only cut one blocks worth first and then sewed it up - but I cut and sewed 12 HST triangles instead of cutting and sewing 6 and then cutting them in half. I wasted a lot of fabric and time! Don't pull a Kerry! lol. Luckily I was able to use what I cut and sewed and will be sure not to make that mistake again. The results...you'd never know I messed up. Whew! So the prize this week. 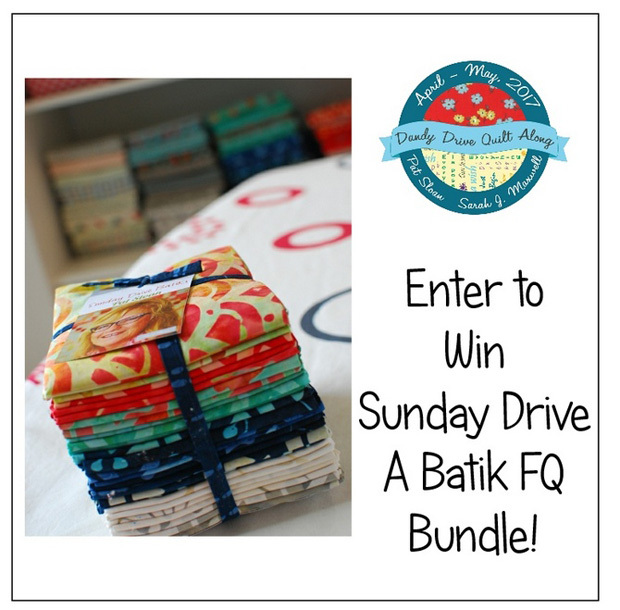 . . they want to give one lucky participant a Sunday Drive batik FQ bundle. Head over to Pat's website (click the image above) and simply enter a pic of your block via the blue button link on her post. Thanks so much for stopping by. I'm looking forward to seeing your stem and full flower blocks, and adding some butterflies next week. Disclaimer: Although I received this pattern for free, opinions are always my own. There are no affiliate links. The fabulous Quilter Pat Sloan kindly invited me to be a part of Sarah J Maxwell's Dandy Drive quiltalong and it starts today...just in time to sew flowers in the studio as they spring up outside my windows. 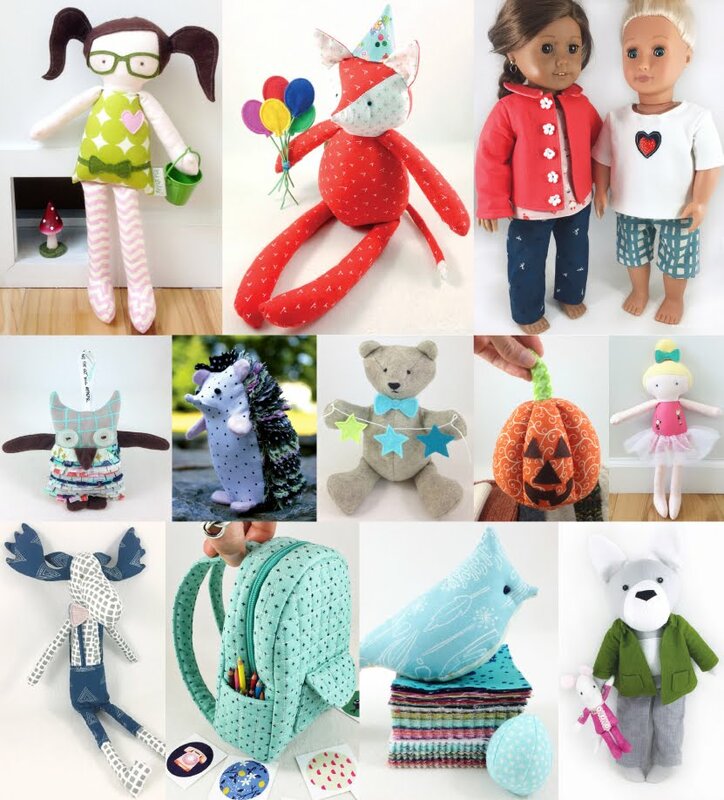 Pat and Sarah have some fun things planned with prizes each week and the pattern is...FREE! 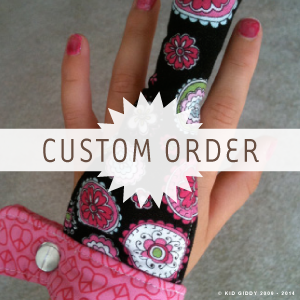 You can download the PDF files each week over on Sarah's website Designs By Sarah J. If you didn't see the yardage info last week - check here (Sarah's Dandy Drive Yardage Requirements). 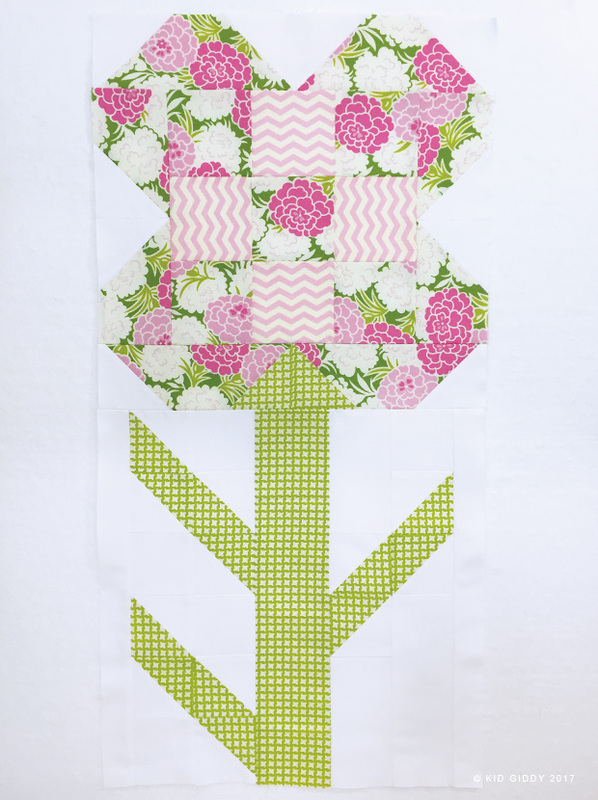 Week 1 is all about the traditional 9 patch block which is the center of each flower. 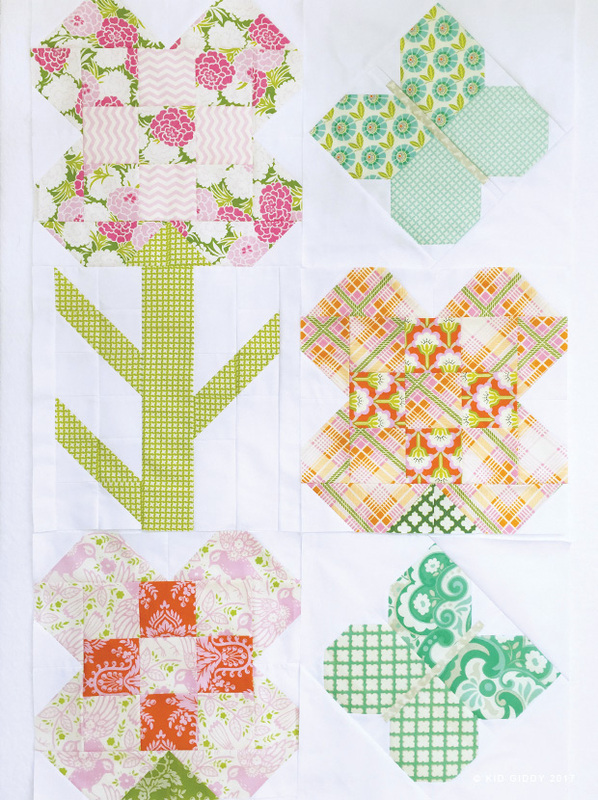 Here are a few of the 9 patch blocks I stitched up using Heather Bailey's Up Parasol fabric collection as well as some prints from her True Colors and Lottie Da collections. I really challenged myself to use fabrics from my stash (that I've hoarded forever) so I had in some cases only a fat quarter for the flowers which worked out great (that just means I won't be able to use the same pieces for the butterflies). I decided I like that plan though because most of my butterflies will be shades of blue, hovering over and around a sea of pink and orange flowers, on a white background. 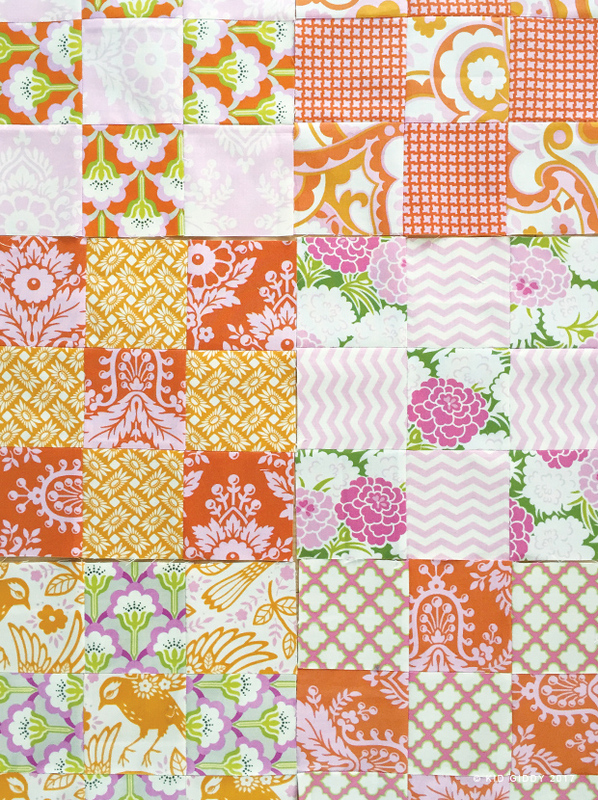 This is going to make a beautiful spring and summer quilt and I'm so excited to see it progress. So the prize. 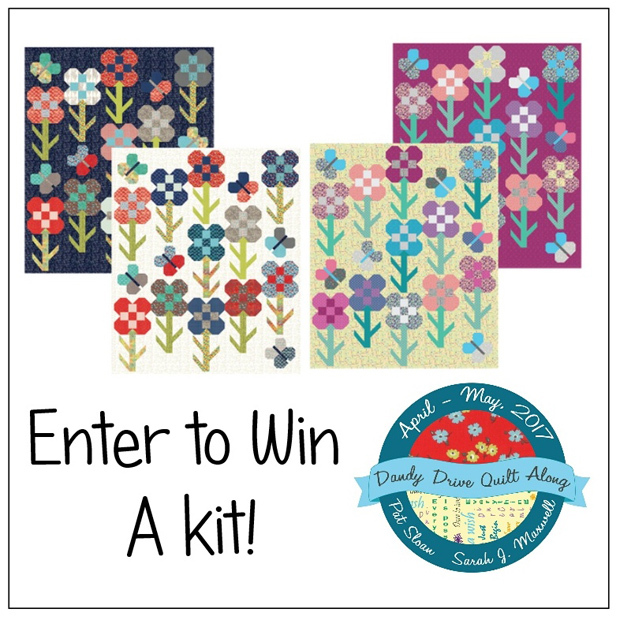 . . they want to give one lucky participant a kit to make the Dandy Drive quilt. Head over to Sarah's website (click the image above) and simply enter a commenting on her block post and telling her which of the 4 colorways is your favorite. They’ll randomly pick a winner to receive that kit. The giveaway is open until Sunday, April 9 at 12 noon, CST. 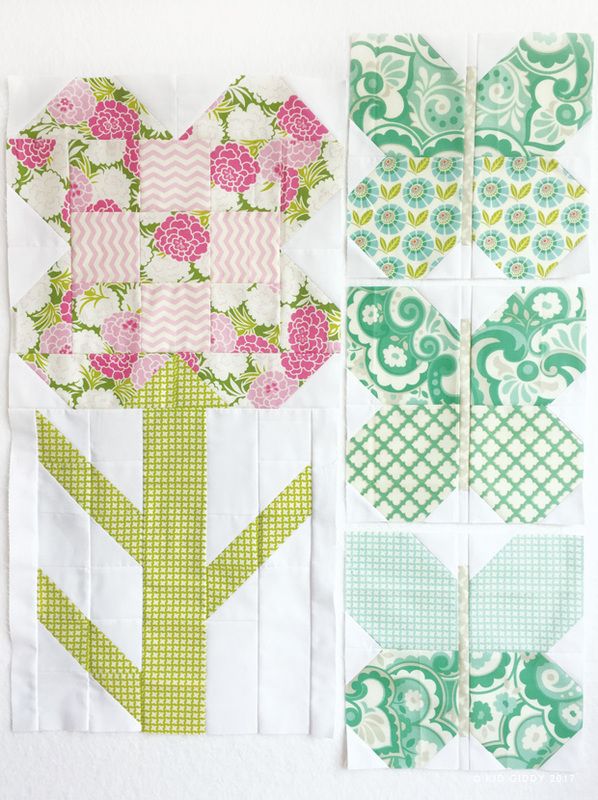 If you don't want to wait you can buy a Dandy Drive Quilt Kit too just check out Sarah's site for more info. Thanks so much for stopping by. I'm looking forward to seeing your blocks, and adding the next part of this quilt. 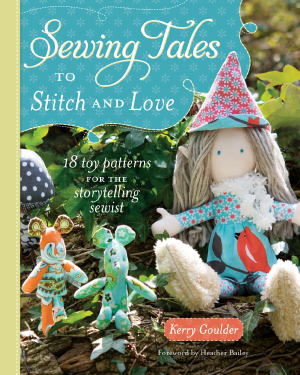 My daughter will be sewing with me which is also fun! She wanted to help make these blocks, but was a bit under the weather. So we really will be doing this together when she's all better.